This picture was taken a couple of years ago for Christmas. 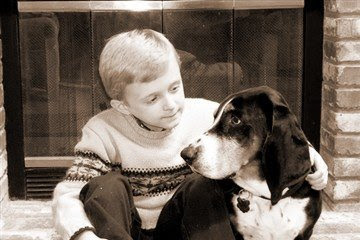 It's one of my favorites of my son with his buddy - Buster. Stop by Wordless Wednesday at 5 Minutes For Mom to see more fun photos! I love the way he's looking at his canine pal. Great photo. This photo is amazing! What a fabulous capture! I too enjoy the look he has on his face while gazing at his buddy! There is nothing like a boyhood friend, is there? I can see why this pic is a favorite of yours - how precious!! THANK YOU so much for the blogger award! I appreciate you passing it on to me so much, ...I am truly honored! And Congrats on winning the award, yourself! You certainly deserve it! Sorry it has taken me so long to reply! Blogger and my computer are not getting along very well! LOL! I am so aggravated! I'll be back when I get it figured out! Seriously, that's a framer! Do you have that framed? What a cute, cute pair! That dog looks like a great companion for an adorable young man. Aw, what a great photo! They are both adorable (handsome) and there's just nothing like a boy and his dog! Thanks for sharing!